I want to win a WordPress Theme #25119 because it’s perfect for my band website. I want to win a WordPress Theme #41270 because it’s perfect for my brand new iOS app. I want to win a WordPress Theme #40857 because it’s perfect for my company website. I would like to win Magento #29830, because I like it! i want to win a wordpress theme #38638 because this template is simple and the background matching with my beauty clinic logo. I want to win a WordPress Theme #40741 because it’s perfect for me. I want to win the Magento theme # 39196 because I want to give my future wife a ecommerce website for your clothing store. I want to win a WordPress Theme #40239 because I always wanted to do a masonry type site and it could be the start. I want Magento Item: #42815. I want to build a E Commerce website. And it’s perfect for me. It’s Responsive and beautiful. I want to win a WordPress Theme #42829 because it’s perfectly suited for my restaurant web site. I really want Magento Theme #43169 as it is so difficult to get a matching theme for Magento that has responsive design. I want to win the item #43180,would be very good for my business blog. Thanks! I want to win item Opencart Theme #41345 because it’s a good looking e-commerce theme and I’ve always wanted to sell underwears online. I want to win a WordPress Theme for my personal blog and would definitely acknowledge both templatemonster and webappers for it on my to-be blog… Cheers!!! I want to win this Magento Theme #43169 . Thanks! 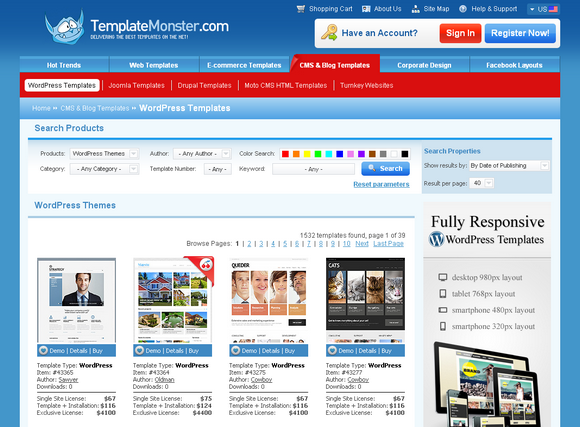 I want to win this Magento Theme #43371. Thanks! I would like to win Joomla template #32262 as I have been looking for a template with features and look like that one for my software site. I want to win a Magento Theme #42354.
navigation… Definitely women love browsing site with this theme. Hello, “I want to win a Responsive Joomla Template #42816 because it’s perfect for my company. I’d love to win a WordPress template #42133 for my future project I’m planning to develop. Simply awesome & I’d love to win a WordPress template #42133 for my future project I’m planning to develop. every one want to win some thing.. some thing..